The snow leopard is one of the most secretive and mysterious of wild felines, hidden away in the mountains of Central Asia, rarely seen, yet globally famous. Snow leopards are popular with children and adults all over the world, despite how difficult it can be to study them. 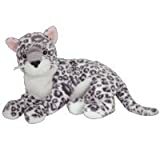 There's plenty to learn about this mysterious creature, so read on for all sorts of fun and interesting facts about snow leopards that kids and adults can enjoy. The snow leopard is a rare creature, preferring to hide away in the cold, snowy mountains, rarely seen by human eyes, and still such a mystery to scientists who seek to study them. With a number of unique traits that set it apart from other wild cats, the snow leopard is a world away from its jungle cousins. It is this uniqueness that makes it so fascinating and popular among kids, adults, scientists, and nature fans. It's hard to find a cat quite like it, and they're a lot better at hiding than we are at studying them. Snow leopards are smaller than other wild cats, weighing around 60 to 120 pounds (25-55 kg), with a body around 2 to 4 feet long (.7 to 1.3m). Their thick, pale fur coat helps them blend into the winter wilderness, and keeps them warm in the frozen, mountainous regions they prefer. While they're fairly large, they're not considered one of the "big cats," since they can't roar, even though they're closely related to them, especially tigers, though scientists still debate where exactly the snow leopard belongs on the cat family tree. Snow leopard kittens in England! Snow leopards live high in the Himalayan and other mountains in Central Asia, in countries like China, India, Kazakhstan, Pakistan, Nepal, and others, preferring the cold environments high in the mountains, which helped give it its name. They usually live above the tree line in summer, and go back down to the forests in winter. 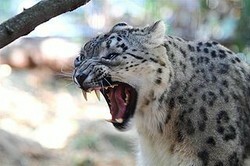 The body of a snow leopard is bulkier than some cats, with long, thick fur to help it keep warm in the snowy mountains. Thick, wide, furry paws help conserve energy, also helping them keep their balance, even when walking through deep snow. Small ears help save energy too, and their long, thick tails can be used like a blanket to keep their faces warm when they sleep, also helping them keep their balance when moving through rocky, difficult landscapes. Larger nasal passages help snow leopards breathe in the higher elevations, where the air is thin and provides less oxygen. And, of course, their pale fur coats help them blend into the environment, with their spots acting like camouflage when hiding among the bushes, keeping them hidden from their prey while they're out hunting. Snow leopards, like all wild cats, are great hunters, and will eat anything they can get their paws on, from small animals like rabbits, birds, and rodents, to much larger prey like goats, boars, or deer. A snow leopard can even take down an animal several times its size. In fact, the only animal in the region a snow leopard has trouble with is an adult yak. When hunting their prey, a snow leopard prefers to ambush the animal from above, jumping down from the rocks overhead and chasing the animal down the mountainside. It finishes off its prey with a bite to the neck, after which it will drag the body to a safe place to eat. Snow leopards are born blind, and stay that way for a whole week. In fact, they can’t even walk around until they’re about five weeks old, and even then, they stay hidden in the den for the first few months. It takes about a year and a half to two years to become fully independent. 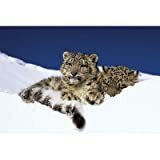 After that, the cubs will leave their mother, explore and find their own territory, and live solitary lives in the mountains until they find another snow leopard to breed with, and the cycle starts all over again. A snow leopard is most active in the morning and evening, when it goes exploring in search of food. And although they can be territorial, snow leopards are less aggressive about defending their territory, unlike many other solitary creatures. In the wild, they'll live 15 to 18 years, and up to 21 years in captivity. Like all wild cats, snow leopards face threats from continuing human development, with new cities, roads, farmland and other establishments gradually cutting into the snow leopard’s territory. Since snow leopards are happy to hunt farm animals too, farmers often consider them to be a nuisance, killing them to protect their animals. Fortunately, the news isn’t all bad. Although the snow leopard is considered an endangered species due to shrinking territory and other human-caused factors, the mountainous environments it considers home are not the sort of places humans like to live, giving it a better chance of survival than some of the other large cats. Although it’s hard to study such an elusive creature, especially since it lives in mountainous regions far away from civilization, scientists estimate that about 4,000 to 6,000 snow leopards live in the wild, with another 700 living in zoos throughout the world. Conservation groups like the Snow Leopard Trust, the Snow Leopard Conservancy and others work to protect this species from extinction, working with local communities and governments to improve its chances of survival. If people are willing to support these efforts and find ways to live alongside them, future generations will be able to enjoy this beautiful animal just as we do. More Fun Facts for Kids! Thanks. I was looking for something fun to write about, so I think I'm sticking with this for a while. Glad you enjoyed it. 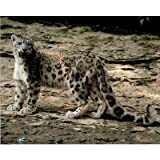 What a brilliant resource, so glad I found your pages on animals, the snow leopard is amazing. I'm sharing these as school age kids research this sort of thing all the time. Great Wizz!